Listen to archived editions now. Don't delay. Do it TODAY! The Light Programme is a radio show hosted by Steve Wood. It airs every Sunday at 13:00 local time on Cabin FM, Herne Bay's Community Radio Station, 94.6 on your radio dial. 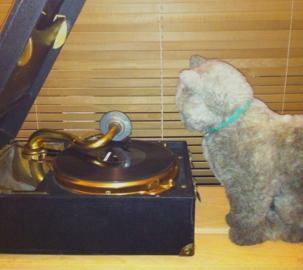 The Catophone "HIS SERVANT'S BUDGIE"
The show takes its name from the "BBC Light Programme", the home of British radio light entertainment from 1945 to 1967. Anything goes: - Serious, light, popular and novelty records make up the fayre on The Light. The programme is anchored in the first half of the 20th century, but sometimes drifts, so you could hear anything from Little Tich to Tiny Tim. Every show includes a musical tryptich of (usually) totally unrelated records and a greeting to members of "The Light Brigade", the show's listeners' club. Previous playlists are on this website. Copyright © 2019 Steve Wood. All rights reserved.